Ambassadors usually meet with politicians, business people, artists or professors. 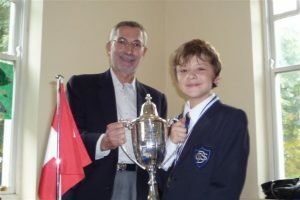 However, on 14 October 2009, Ambassador Loeliger travelled to Dundalk Grammar Junior School (Co. Louth) to get together with children aged four to twelve. Upon a suggestion of Swiss citizen Mrs. Valérie Swan and invited by the School Principal, Mrs. Elaine Lait, he assisted at the yearly prize giving ceremony of the School. 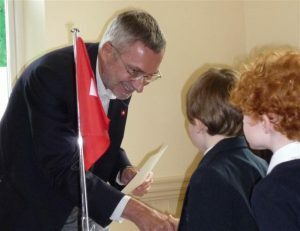 Around 60 children received certificates and medals and the Ambassador had the pleasant task of handing over the prizes and congratulating all the kids for their achievement during the last school year. Afterwards the Ambassador spoke to the children and stressed the importance of a good education, admitting he did not particularly like to go to school himself. The kids wanted to know where he had travelled before and asked him what an Ambassador was actually doing. Mr. Loeliger explained that he was helping Switzerland to communicate with Ireland but that an Embassy would, for instance, also issue passports to Swiss people abroad and give them consular protection. Finishing his short address he asked what Switzerland was famous for. After a (very) short time one kid shouted “Chocolate!”, and he was glad to announce that he had brought some for all the kids. 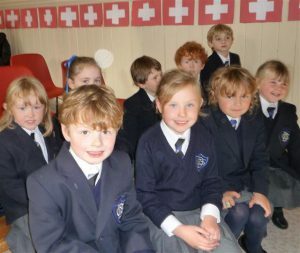 With Swiss chocolate in their tummies and the proof of their accomplishments in their hands and around their necks, the juniors were more than happy. After saying good-bye to everyone the Ambassador travelled back to his office at the Embassy in Dublin where the left-behind stacks of files awaited him. Maybe Ambassadors should go to school more often.